An intricate laser cut design by Julene Harrison, available on Folksy and Etsy. Julene also takes commissions for original hand-cut paper cuts - see some of her commissions here. Do you have a favourite phrase you'd like to see in an artwork? Love the cut paper and the quote. 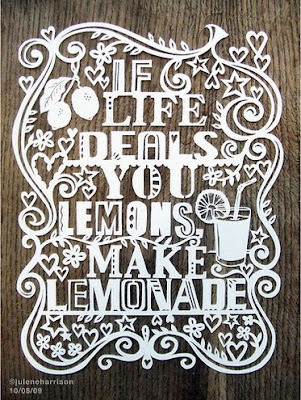 Another version..."When life gives you lemons, add vodka." I always love checking in on your blog! Lovely! I did a post about them too. Such nice messages. love it! such exquisite detail and doesn't cost a fortune! so so beautiful!!! maybe... dance like no one is watching, and live like its heaven on earth?